There are not too many restaurants that are run like the Longbeach Café nowadays, but you will find that the owner is in the kitchen working right alongside the staff, most of which have worked together for years. The food has some Southern influence, and you get a lot of it for a great value. Longbeach Café is a great place to eat for breakfast and lunch and the friendly staff and excellent service is what keeps people coming back for more. Located at the Northern tip of the island, Longboat Café has a quaint, quiet atmosphere that will give you a little peace before you start your day. Casa Del Mar has the best beach lodging on the island! View our resort map to for quick and easy condo searches. Many call the Blue Dolphin Café the hidden gem of Longboat Key, and we can’t agree more! This café is known for its great breakfast prices and daily specials. There are two locations, but we recommend the larger one if you have a larger group. We suggest trying the omelets which are said to be exceptionally delicious. Looking for something a little different? Try the Blue Dolphin Café out for a palette change. Check out Casa Del Mar Resort’s lodgings, which include condos with full kitchens, access to the beach and a heated pool. Harry’s Continental Kitchen is known as one of the best breakfast places on Longboat Key for Sunday brunch. Known for its incredible menu choices and fabulous service, it’s no wonder people choose this restaurant for breakfast over and over again during their vacation. Some of our top recommended dishes are the eggs Benedictus, German pancakes, seafood omelets, and their banana bread. Need somewhere to relax on vacation? Casa Del Mar has a variety of great condo accommodations in a tropical resort-style layout. Eating at Maison Blanche is said to be an amazing and unforgettable experience because of the quality of the food and service. They can accommodate large and small groups with ease. There are so many food options at this establishment however, we suggest trying the cold herb soup, crab roll, tomato, watermelon salad, ice cream with warm squash soup, homemade rolls and baguettes. You really can’t go wrong with anything here though so don’t be afraid to try something out of the norm. The Maison Blanche is one of the few great restaurants that you have to try while staying at Casa Del Mar. Casa Del Mar has the vacation condo that provides you with the ultimate in comfort. Use our resort map to find a room as unique as you are. The atmosphere of the Dry Dock Waterfront Grill is said to be perfect because of its perfect placement on the water. Some of the top food here is the lobster tacos, the blackened grouper, fish and chips, and the fish camp soup. Every visitor that eats here raves about the quality and freshness of the food. Don’t forget to finish your meal with a slice of key lime pie. After all, nothing gives that Florida “feel” quite like a slice of tart yet sweet key lime pie. Casa Del Mar knows what you need after a slice of that pie – a cozy bed to fall asleep in. Quickly find the condo that has everything you need. The scenery is part of what make the Chart House great and the second part would have to be their happy hour. The selection and food presentation are beyond expectation, and the service here is exceptional. We suggest going during happy hour for the best prices and the appetizers. If you are interested in the chocolate desert, make sure you tell them ahead of time as it takes approximately 30 minutes to prepare. Casa Del Mar has the condo rental that you want for great prices at a great location. Check them out here! Although pizza isn’t really anything special to most people, Ciao restaurant somehow makes pizza into an exceptional dining experience. If you decide to dine in, you will be treated to some of the best homemade bread. Their Caesar salad is said to be delicious as well. The pizza crust is thin and crisp and no matter which toppings you choose, it’s sure to taste incredible. If you want to catch the early bird, you better get here early because it tends to get busier later in the evening. If the weather is nice enough, you should try eating out on the patio to have the full pizza and beach experience. Find your perfect vacation lodging here at Casa Del Mar using our resort map. The Euphemia Haye Restaurant has been a staple of Longboat Key for over sixteen years and is still as amazing as the day they opened. They are best known for their duck and sweet nut bread, but most visitors can’t stop talking about their dessert room on the second floor. There is plenty of variety to choose from when it comes to your dinner, and no matter what you order, it is always guaranteed to be delicious. 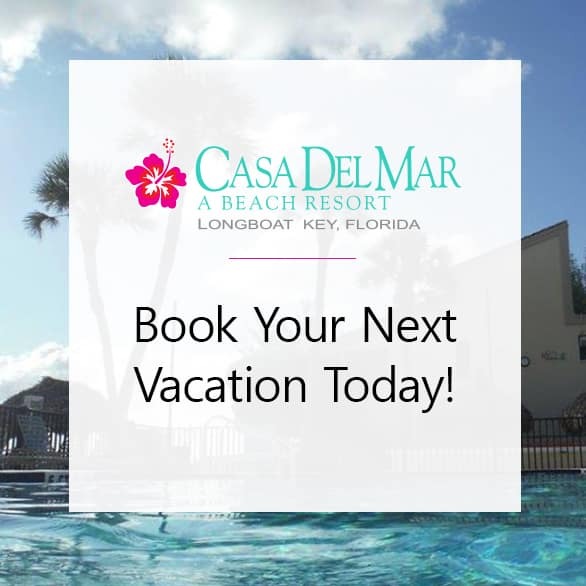 Casa Del Mar has the resort lodgings that you and your family need after a good meal! Lazy Lobster has a reputation for being one of the best restaurants in the area due to its fresh ingredients and the chef’s willingness to accommodate any dietary restriction. The food is always excellent as is the scenery and the service. We suggest starting off with the lobster bisque as your beginning course and the lazy lobster meal as your main dish. If you have room left, don’t miss out on the chocolate brownie crème Brulee. We promise you won’t be disappointed! Casa Del Mar has your vacation accommodations after a day of fun. The Mar Vista Dockside Restaurant and Pub will surely not disappoint. Many visitors say that the Mar Vista is one of the most unique dining choices and the area. A favorite of many customers is the tuna steak as well as the chicken salad. The view of the intercoastal waterway is magnificent and is quite a romantic setting at night, complete with twinkling lights strung throughout the trees. The menu is said to have something for everyone so no one in your party will go hungry. Casa Del Mar provides luxury vacation rental condo options.